It was sometime in 2007 that I first came across Randy Pausch’s "The Last Lecture" video in which Randy talked about about "Really Achieving Your Childhood Dreams". It has been an influential talk in my life and I have seen the video a couple of times since then. Recently I bought the "The Last Lecture" book by Randy which is based on this popular video. The book goes through the same topic as the video, but also has interesting additional material including background material on the lecture. This is my review of the book. Randy Pausch was a computer science professor at Carnegie Mellon University in Pennsylvania, US. His expertise was in virtual reality and he went on to create the Alice project. At the age of 46, he was diagnosed with pancreatic cancer. Carnegie Mellon had a lecture series called "the last lecture" (now known as journeys) where faculty members share their reflection on their life journeys. 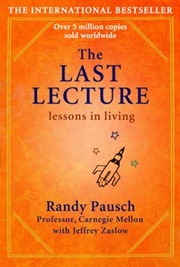 In the case of Randy, "the last lecture" was really like his last lecture since he had only months to live due to his terminal cancer. On September 18, 2007, Randy Pausch gave his "last lecture" titled "Really Achieving Your Childhood Dreams". The lecture outlined his childhood dreams and how he went about achieving it in his life. It is in essence a short summary of his life and he said he intended the lecture as a message to his children. The video of the lecture became viral and as of writing this article, it had over 15 millions page views! "The Last Lecture" soon became an internet sensation and Randy went on to do appearances in ABC Network, Oprah Winfrey Show, Time Magazine and also gave a speech at commencement ceremony in Carnegie Mellon. He also wrote a book titled "The Last Lecture" which was sold over 5 million copies world wide. Randy died from pancreatic cancer on July,2008 at the age of 47. However his book and his lecture will remain a source of inspiration for the future generations. (I) The Last Lecture – A background on the last lecture at Carnegie Mellon. (II) Really Achieving Your Childhood Dreams – Much of the material here are also in the video. (III) Adventures … And Lesson Learned -This is a collection of his life experiences and what he learned. (V) It is About How to Live Your Life – Randy lists the rules by which he tried to live his life. The first thing you notice is that the book assumes that you have seen the last lecture video. Many chapters refer to the background of the video and if you have seen it, you immediately make a connection. When you read the book, it feels as if you are going through the entire life of Randy in a few minutes. We learn how he achieves his childhood dreams even when there are some really hard obstacles. According to him, the obstacles are there for a reason, it is to keep the "other" people out! "The brick walls are there for a reason. The brick walls are not there to keep us out; the brick walls are there to give us a chance to show how badly we want something"
Most of his advice on life is actually ancient wisdom and clearly these are all principles valid till the end of humanity (importance of hard work, dreaming big, showing gratitude etc.). It is interesting to see them in the context of Randy’s life. If you are looking for any soft of deep philosophical discussions, this is not the book for you. "Experience is what you get when you didn’t get what you wanted"
At just over 200 pages, "The Last Lecture" is a small book. In every page you find a man’s agony in knowing that soon his children won’t have a father to protect & guide them. Randy writes in such a honest and passionate way that you will find it hard to stop once you start reading the book. My Rating : 8/10. This is a good book. It may have a positive influence on the way you live. "If I only had three words of advice, they would be, Tell the Truth. If got three more words, I’d add, all the time." "When you’re screwing up and nobody says anything to you anymore, that means they’ve given up on you." "It’s not about how to achieve your dreams, it’s about how to lead your life, If you lead your life the right way, the karma will take care of itself, the dreams will come to you." While working on it I thought it might benefit Kerala school children and posted in in my Malayalam tutorial channel which has a few other assorted tutorials. As it involves a good amount on investment with time I don’t want to blotch it. You have read the book. If you can spare 15 minutes on the ‘Connecting the dots’ video and express your critical suggestions, it would be useful for the work and also earnestly appreciated.